I feel like all my posts lately have been photo-ridden and knitting-free, and this one holds true to that second bit, but has only a couple of photos, because I didn't have my camera with me, because no one in their right mind would bring a camera where I was going (although lots of people did). We went to HersheyPark for a couple of days, and they were two of the fun-filled and exhausting days I can remember. Let me preface this by saying that I suffer from motion sickness, so spinning rides are absolutely out of the question for me, and I also suffer from extreme terror, so roller coasters are also out of the question for me. Dave is better at all of the above, but no longer a teenager, so there are those limitations as well. The children, however? No motion sickness. No fear. Toaster took RockNoodle on her very first serious roller coaster ride, and he started with this awful-sounding thing that went crazy fast and crazy high and all over the place and upside down and G-force and just the kind of thing that would make me mental--and that was her introduction. All other roller coasters were tame after that. 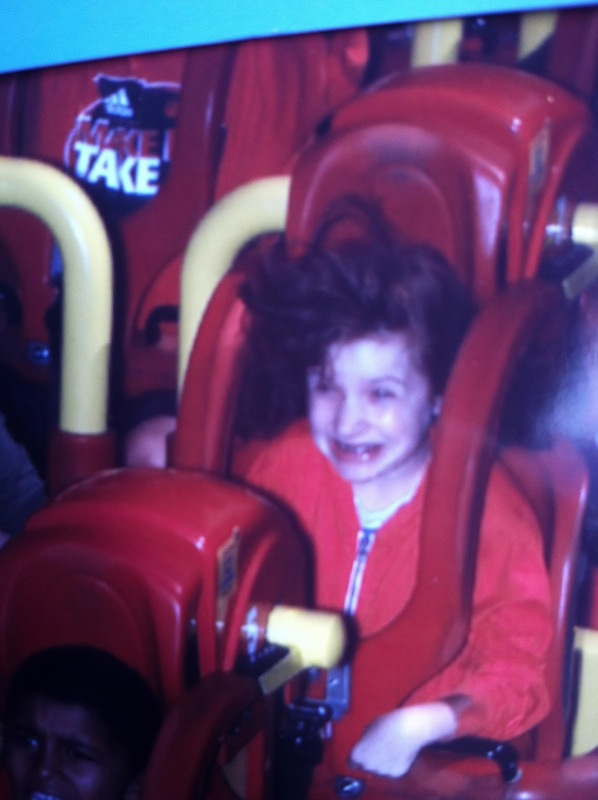 This photo is not on that one, it's another roller coaster, but it gives you an idea. This roller coaster is not that one either; this horrifying-looking thing is also much tamer than RockNoodle's Very First Roller Coaster. Shudder. But we kind of figured that was how it was going to be. Toaster is a veteran roller coaster enthusiast, and RockNoodle had been anxiously waiting to grow tall enough for some time. Dave and I knew that most of our time would be spent applauding Willow as she went round on balloons and carousels and cars and bugs and whatnot, and that we would enjoy that a great deal and maybe Dave would go on a few roller coasters and maybe I would get in a water slide or two at the water park (I do like those. A lot) and we would all be happy. And that is kind of how it happened, that first day. Willow loved the balloons, she loved the carousel, she shouted "wheee!" 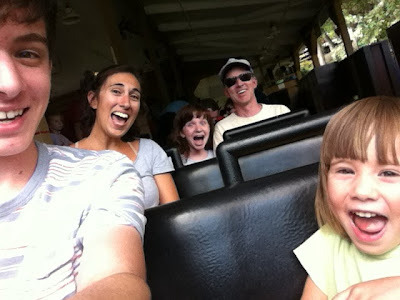 on the fake roller coaster and "buzz!" on the bug rides and then we splashed in the wave pool and all collapsed with exhaustion (except Toaster and RockNoodle, who rode the above scary rides in the dark to make them scarier). Dave went on his two roller coaster rides--including the one pictured above--and I psyched myself up and went on the super-scary splash-down ride with Toaster and RockNoodle that was actually awful and I thought I was going to die but then it was over. But on the second day everything turned on its head. On the first ride of the day, the Frog-Hopper, I went on with Willow because I figured if I could survive that awful freefall I could probably handle a ride that two-year-olds are allowed on. "Handle" turned out to be an exaggeration. I was clutching Willow's hand and yelping. I wish I were kidding. Willow, on the other hand, giggled and laughed. And then she went up up up in the sky and spun around with her father with no buckles on while I stayed safely on the ground and had a heart attack. I could see her face, though (you know, because it tilted practically upside down) and it was clear she was having a blast, which made it almost bearable but no less terrifying. Emboldened by this, we took her on The Coal Cracker. Again, I was scared to do it, Dave laughed at me and said if I could survive the water ride the day before, I could probably handle this one. I screamed like a banshee and Willow laughed and asked to go again. Shortly thereafter, Dave took Willow to walk her around to try to get her to take a nap (ha) and Toaster and RockNoodle took me under their fearless wings. 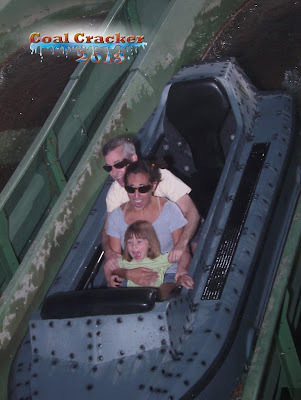 Nothing I rode was nearly as scary as that water ride, but I did go on two rides that are categorized as "Aggressive Thrill Ride"--three words to strike fear into any sane person's heart. The first was Wild Mouse, which didn't have any crazy drops or loops or anything, so I figured it would be okay, but it rocketed around these sharp turns with nothing between you and, you know, death, so I clutched at Toaster and sounded like a broken Halloween record--"Aaaah!" "Aaaah!" "Aaaah!" "Aaaah!" But here's the bit where I don't know what I was thinking and maybe I lost my identity somewhere and was replaced by an alien. 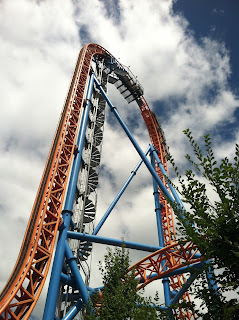 I let Toaster and RockNoodle talk me into going on the Sooperdooperlooper which has, unsurprisingly, a loop-the-loop. I never in my life thought I would go on one of those. Ever. And you know what? It wasn't even that scary. I mean, I screamed, sure, but the loop itself was actually kind of relaxing and I would totally do that again. Who is this person?? We ended the trip with a coaster all together--the Trailblazer, Willow's first ever roller coaster, but clearly not to be her last. Maybe someday I'll even be brave enough to go on one with her. P.S. I lost my voice from all that screaming. Nobody else did. every time I read your blog I smile. every time.